The potential work process reduction from automation implementation is substantial in the average workplace - to say the least. 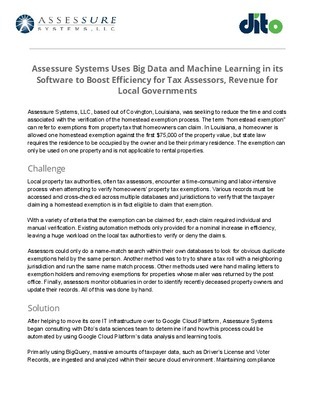 Assessure Systems, LLC was seeking to reduce time and costs associated in the verification of the homestead exemption process - a labor-intensive process spread across various records and jurisdictions. Read this case study to find out how big data and machine learning helped them overcome this hurdle.